Now for this Survival Tip, I want to talk about personal safety in the Philippines. This is more in relation to the environment as opposed to bag snatchers and pickpockets. Here we will discuss personal safety measures you need to be aware of while driving or being a pedestrian. We discussed in the previous chapter about the traffic in this country. Now we will talk a bit more about traffic safety. One of the most confronting things aside from the sheer volume of traffic is the manner in which Filipinos drive, and also the vehicles in which they use. It always comes as a great shock for visitors to this country to see Filipino road etiquette, or lack thereof, in action. It never ceases to amaze me how friendly, mild-mannered Filipinos change once you put them behind the wheel of a vehicle. Common courtesy and respect for fellow man totally go out the window. Road rules are basically non-existent and it becomes a case of every man for himself – like a stampede on wheels. I have seen motorbikes riding down footpaths, I have seen vehicles reversing down the road in busy traffic, I have seen vehicles reverse into traffic without any care for themselves or other drivers, I have seen pedestrians running across the road risking their lives, and I have seen bus drivers driving busloads of people as if they’re the only vehicle on the road. Some of the things I have seen and experienced are mind-boggling and can leave your heart in your throat. We often joke that the lines on the road and traffic lights are purely there for guidance and that it is not compulsory to adhere to them. One of the more frustrating elements is when there is a traffic jam. Drivers will block a busy intersection with a vehicle, even though they really can’t go anywhere. However, they manage to block the traffic trying to cross the intersection creating gridlock. One of the things that first shocked me when I came to the Philippines was not only the sheer volume of vehicles on the road but also the different types of vehicles on the road. There are so many different types of vehicles you normally might not be used to. This can almost make you feel like you are in a computer game. In the Philippines, you will find cars, motorcycles, buses, trucks, tricycles, bicycles, scooters, jeeps, and improvised vehicles of all sorts. Then for good measure, there are also pedestrians and animals just to add an extra element of difficulty. 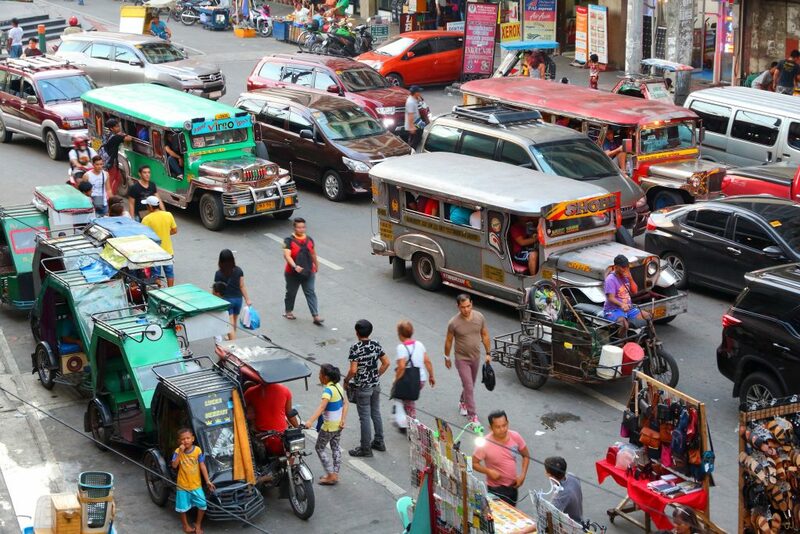 This shows the diversity of traffic on the road in the Philippines. There are cars, tricycles, jeeps, pedicabs (bicycle with sidecar), street stalls and pedestrians. There really is so much going on and with so many potential hazards, you really need to be cautious. One of the things that is not common and also illegal in Australia is for a motorcycle to ride in between a car and the gutter or curb. When I first moved to the Philippines I learned this lesson very quickly and also the hard way. One afternoon I was getting out of a taxi cab when all of a sudden, much to my complete surprise, a motorcycle rider rode his bike straight into the door. He wasn’t going very fast but it certainly scared the crap out of me. Of course, because I’m a foreigner, it was my fault. He insisted on me paying for the damage that had been caused to his bike by HIM riding HIS motorbike into the door of a taxi cab on a part of the road in which he should not have been. Then I had the taxi driver insisting that I pay for the damage caused to the door because it was my fault for opening the door. Total madness! Speaking of pedestrians, if you do happen to be walking around, you really do need to exercise caution. If it isn’t hard enough to avoid motorcycles riding down the footpath, or vehicles turning without indicating, you will find footpaths that are in terrible condition. It’s not uncommon to see large potholes as well as large cracks in the pavement. It is also not unusual to find a tree smack bang in the middle of the footpath. It is also not uncommon for a footpath to just stop, leaving you with nowhere to walk at all. For the first few years that I lived here, I didn’t have a car of my own. I didn’t really need one because I worked in Makati and I lived in Makati (Salcedo Village to be precise). At one point, the office in which I worked was one block away from where I lived. At that particular time, I couldn’t afford a car so it made sense for me to live is close to work as possible. Luckily this meant I was able to avoid the traffic and the lengthy travel times to get to work. As a consequence, I spent my first few years here purely as a pedestrian. 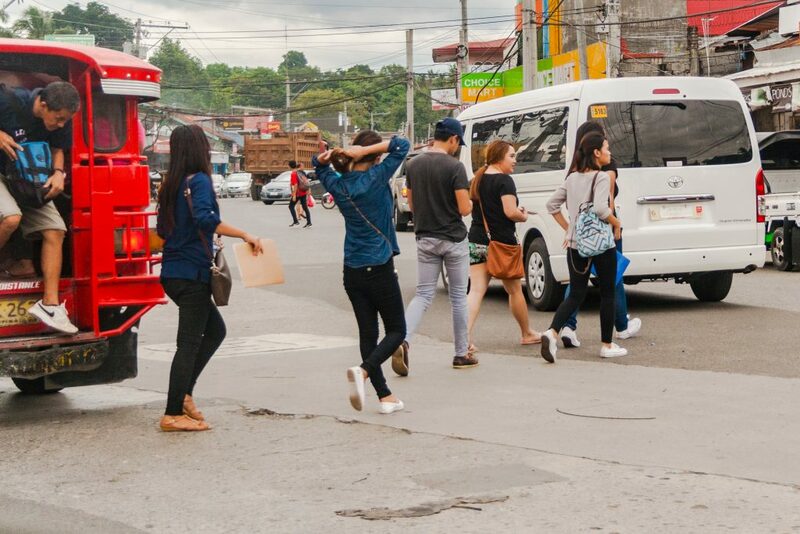 Being a pedestrian in the Philippines is one of the toughest modes of transport there is. You really need to have your wits about you. A majority of the drivers don’t follow the road rules, particularly motorbikes. As mentioned in the previous section, it is not uncommon for a motorbike to be riding down the footpath. They ride around corners without looking at other traffic and are generally very disrespectful towards anyone else on the road. Being a pedestrian in the Philippines reminds me of the arcade game “Frogger”. You are constantly dodging so many things like potholes and other obstacles from the damaged pavement or road, plus all manner of vehicles. You really need to have your wits about you. In the Makati CBD area, in particular, there are a lot of barriers. These are there to prevent pedestrians from crossing intersections at street level. I understand this is done to ultimately protect pedestrians however, this can be a major inconvenience. The reason they put the barriers at the intersections is to encourage you to use the underpasses made available to pedestrians. These underpasses will generally have a set of stairs for when you’re walking down, and an escalator to take you up to street level. These underpasses are extremely hot, seriously crowded with people and are just like being in a sauna. Quite often the escalators are not working and you find yourself having to walk up the stairs. This only adds to the inconvenience, especially if you are dressed for business in long pants and a shirt. Hopefully, these Survival Tips on personal safety will help to enhance your chances of survival in the Philippines. For the next survival tip on Natural Disasters In The Philippines, please click Survival Tip #14 to read more. If you missed the previous survival tip on Healthcare In The Philippines, click Survival Tip #12 to read more. If you have any comments or (near death) experiences with personal safety in the Philippines, please feel free to leave your comments below. I would love to hear from you. The University of Santo Tomas was founded in Manila, Philippines, by Dominican monks in 1611. It is the world’s largest Catholic university in terms of population. Both it and the University of San Carlos in Cebu City, founded in 1595, are older than Harvard University, which was not founded until 1636 (courtesy of https://www.factretriever.com/philippines-facts).